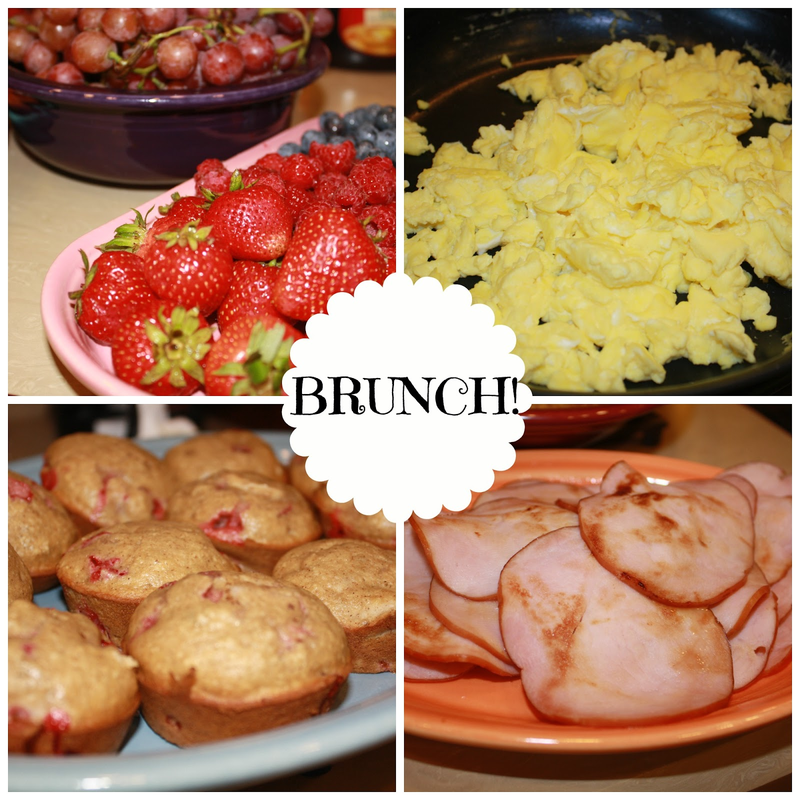 I don't know about you, but I just love Sunday brunch. I could eat breakfast foods all day, everyday. Unfortunately, brunch isn't exactly conducive to calorie counting (croissants, cinnamon rolls, waffles, bacon, etc. etc.) 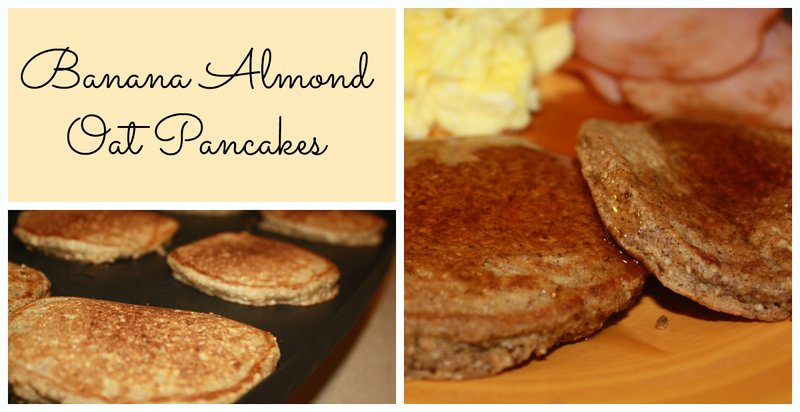 Last week, Roni from greenlitebites (as well as several other awesome blogs) shared the recipe for these delicious Banana Almond Oat Pancakes! They seemed perfect to try out for a healthier version of brunch. Grind the oats and almonds in a food processor. In a bowl, mix together the dry ingredients (ground oats/almonds, cinnamon, nutmeg, baking powder, baking soda). In another box, mash the banana. My husband was happy to help with this part. Whisk in the almond milk, egg, and vanilla. Mix the dry ingredients into the wet. Cook the pancakes on a griddle or skillet at medium heat. Spray with cooking spray or coat with oil. Each pancake is about a 1/4 cup (the recipe makes 10 pancakes). I doubled the recipe to make them for the family. I added a little bit of light syrup to mine. You could also add slices of banana and drizzle with honey. I absolutely LOVED these! They had so much more flavor than a regular pancake. These will definitely be a staple in my house- especially for only 75 calories a pancake! Check out greenlitebites for all the nutrition facts, including Weight Watcher points! To top off this healthier version of brunch, we enjoyed eggs, canadian bacon, SKINNY strawberry banana muffins, and fresh fruit! They came out great! So glad you liked them! These sound delicious! Thanks so much for sharing and thanks for stopping by Posed Perfection and leaving a sweet comment on my Patriotic Fruit Ice Cubes. I appreciate your sweet words. I am your newest Facebook fan. I hope you'll visit again soon. Thanks for stooping by Toronto Mama! Breakfast is my favourite meal of the day, and these pancakes look to die for! I'm forever looking for healthier options for my baby (who adores pancakes) so this will be on the docket for this weekend. Pinning now. Oh I love breakfast foods! This looks like a great recipe. If only I had a food processor! I make some like that all the time and I can only agree, they taste fantastic! Great recipe! I replaced the egg with a flex meal egg, added honey and semi-sweet chocolate. My 5 year old daughter loved them..